This year, we decided to wrap up our kids discipleship program in style! Well, Middle Eastern style, that is. 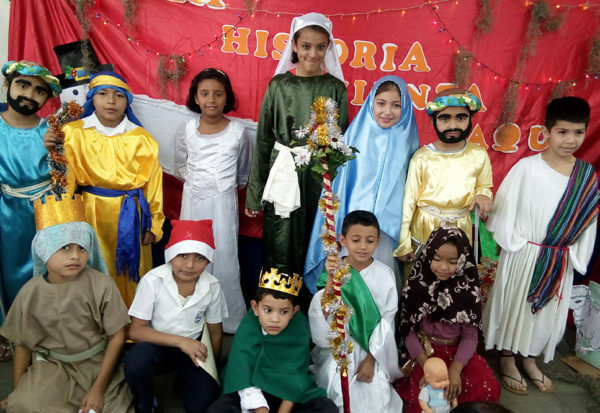 Our Christian Education coordinator, Martha Cortedano, had the great idea to close out the year by having the kids dress up and act out the Bible stories they’ve learned about all year long, focusing especially on the birth of Christ. We were thrilled to have thirty-seven children and seventeen parents participate in the festivities, and they really went all out. The theme verse for the day was Proverbs 22:6, which says, “Start children off on the way they should go, and even when they are old they will not turn from it.” This perfectly exemplifies the heart behind our children’s ministry program. Through all the silly games, messy crafts, and loud songs, our desire is that something of what’s being taught would stick. We share the gospel with young hearts, teaching them about the character of God and the way that leads to true life. It is our firm conviction that the Word of God does not return to Him empty, and we pray that the seeds planted today will one day blossom and produce spiritual fruit down the road. It was a beautiful thing to see such excellent coordination between teachers, students, parents, and the Rayo de Sol staff, and we pray that this celebration would serve to more deeply embed all the things the children have learned about God throughout the year. This entry was posted in Blog on November 30, 2018 by Scott Finlayson.